I've tried a lot of tools in my years of cookie decorating. I always seem to come back to the simple products. I use the same 8 bottles of food coloring for almost every set of cookies I make. In fact, I would guess that I use 10% of my decorating supplies 90% of the time. It's pretty rare when a new product makes the 10% list right away. 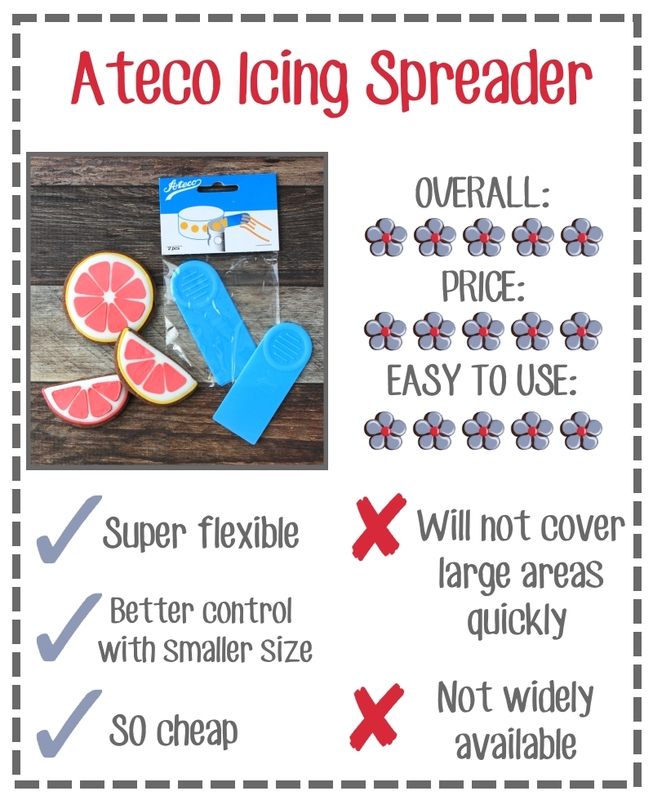 But I'm telling you... not only did these icing scrapers make that list...I ordered 30 more within a month of purchasing the first set. But, I'm getting ahead of myself. 2. It's really flexible. Because the plastic at the tip is thin, you can almost FEEL the stencil as you scrape icing across it. It's easier to use just the right amount of pressure to fill the spaces of the stencil without leaving excess icing all over the place or scraping half of it back off again. Also...I'm not sure if it's the type of plastic or because it's thin...but I've been using my scraper for months now and the edges haven't gotten fuzzy like they do with some of my thicker scrapers. There are a couple of down sides to this scraper. The size works both directions. Because it's small... I LOSE IT ALL THE TIME. That's why I bought 30 more of them. So I never have to be without one. Trust me -- don't buy just one set. Also, because of it's size, you can't cover an entire stencil in one swipe. I'm not actually capable of doing that in the first place, so it's not so much a negative for me...but for you stencil experts out there, it might be a drawback. The other sad thing is that they aren't sold everywhere. They should be though. I get mine HERE. Is this particular scraper necessary to your decorating life? I'm going to go with a solid MAYBE. If you use stencils and icing and want control over that icing -- you need this scraper. Yes...you can use a knife or a spatula or the bigger white icing scrapers. This one is just easier to use. And weirdly fun. I like it so much I made you a video. See? Are you in love yet? Bottom line -- at 40 cents a scraper, you simply cannot find a better icing scraper. At ten times the price, it would still be worth it to me. 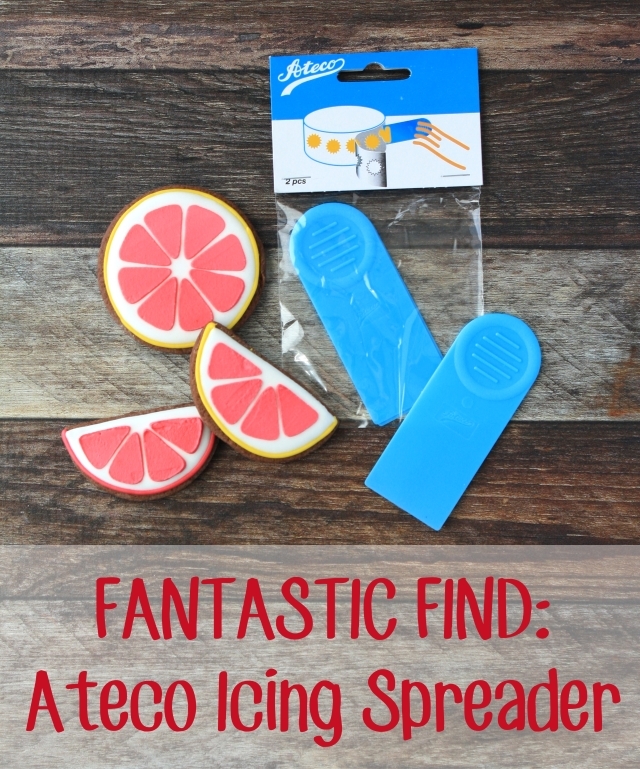 I want to spread this spreading joy so I'm giving away a 2-pack of spreaders to THREE of you. Just click that easy entry button below by midnight on Friday, October 14, 2016. Can't wait? Get your own icing scraper HERE. Or with Amazon Prime HERE. Get it HERE if you live in Australia.